Southern Turkey's Isparta, known as the homeland of roses, is a perfect destination for a short, day-long getaway that can start with the first sunlight. The city produces some 65 percent of rose oil in the world. Producers go to their gardens before sunrise and start the harvest with the first light of the day. Picked with a great effort, sometimes in very hot weather and sometimes under the rain, roses are brought to buying centers set up in villages and towns. They are then transferred to factories for further processing. The roses are boiled in hot water boilers and once it is completed, the water is transferred to a separate boiler. After the second boiling, the oil is filtered and is ready for export. 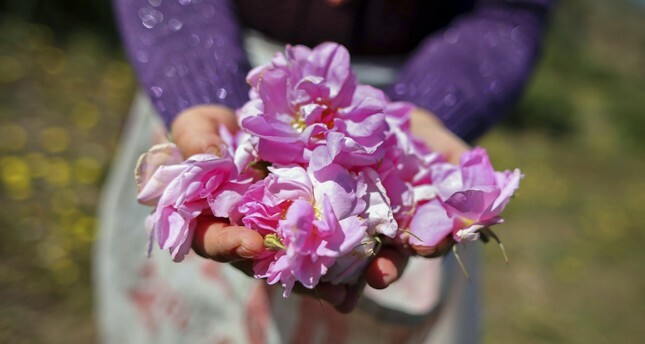 Turkish and foreign tourists who visit Isparta's villages can pick roses in gardens and learn about the history and preparation of rose oil at the factories. At the rose gardens, which attract with their smell and visual beauty, visitors then take photos. They can also enter rose pools at the factories. Ali İhsan Çolak, a local grower, told Anadolu Agency (AA) that they start to work after the morning prayers. They love their job. He said they put the picked roses in sacks first before taking them to the factories. "Picking roses is hard work. They have thorns. However, if you love roses, you should endure the thorns. It can prick your hand while you get wet in the rain or sweat under the sun. Therefore, it is really difficult. As the altitude is high, roses are of high quality. The rose gardens are really beautiful. They smell good and look great. We get used to its smell. However, those who smell it for the first time are mesmerized. Many tourists visit Isparta these days. The rose gardens are becoming famous." Etham Coşkun, another local farmer, said they work in the gardens before the rose harvest. "We work throughout the year to make the gardens more productive," he said. "It is so relaxing to work in these gardens. I find peace here even if we work under hard conditions. I had cancer, and my doctors recommended fresh air. My work here has positively affected my health. I am overcoming cancer. I am happy. Thank God." Neslihan Gürsoy, who came from Istanbul to see the rose gardens, said it felt really good. "We are picking roses. Then, we will go to the factories and learn about the history and process making rose oil. The nature and the smell of roses are really beautiful," she said. Güler Akdalay from İzmir also thought that the rose gardens in Isparta were really beautiful. "Everyone should visit this place. It is really unique," she said.